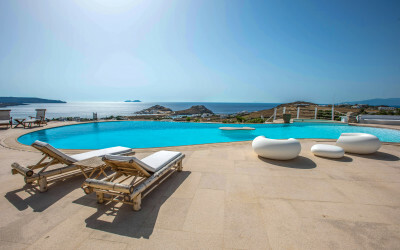 ALEGRIA villa is located in one of the most cosmopolitan destinations worldwide, Mykonos Island. The Villa is an exclusive venue and luxurious accommodation choice. ALEGRIA provides a large infinity lake shaped pool (22m) with heated jacuzzi, a pool lounge area with BBQ, a chapel, helipad, modern gym and a spa room. A maximum of 30 guests can be accommodated in the 13 en-suite bedrooms. On the first level, there is a 60 sqm honeymoon suite with infinite sunrise sea views and a private 40 sqm terrace which is equipped with a relaxation outdoor jacuzzi. There is also a romantic 55 sqm suite with a ‘Juliet’ balcony, with unrestricted sea view. One open-plan extravaganza suite of 55 sqm with a designer round bed and a private jacuzzi on its terrace overlooking the Mykonian Sea. On the pool level there are two executive suites each 45 sqm, with three bathrooms, while one has a hydro massage bathtub. There are also two spacious living rooms with unlimited sea and pool views. Two fully equipped Kitchens, professional ‘Chef’s’ kitchen with walk-in chilled pantry. This level includes a fashionable fireplace, reading lounge, spacious bar corner, wine cellar, a library and two separate toilets. The garden level is divided into Apartment A with 150 sqm and Apartment B 110 sqm; each with two en-suite double bedrooms. Apartment A and B consist of two spacious double bedrooms with en-suites. At the garden level, there is also an airy living room with open-plan kitchenettes and two separate toilets. The Stonehouse of 200 sqm has four cozy double en-suite bedrooms and two ample living rooms with open-plan kitchenettes. All indoor areas are fully air-conditioned, with high-speed wireless internet, indoor and outdoor smart music system via airplay. The Villa also has a fully equipped Gym, luxurious spa room, separate meditation corner in a rock garden and a helipad. The 22 meters lake-shaped infinity pool makes the property as well as the endless Aegean sea view even more breathtaking. The pool is equipped with hydro-massage and reverse swimming system. Adjacent to the pool there is a heated jacuzzi of 6 independent seats, a 220 sqm lounge, and a dining shaded veranda with BBQ. Garden flat area of 1200 sqm with a private small chapel has two changing rooms, two shower rooms, and two separate toilets. The garden offers two event areas overall. The first garden event area, of 1200 sqm, can accommodate up to 700 seating places. The small private chapel is surrounded with the ceremony -sitting- space. A dinner, a gala area, a dance floor and a stage belong to this area. The second garden event area is located on the pool zone with a total of 600 sqm, fitting 220 seating places. The second event area has a lounge area of 400 sqm, with BBQ and dining sheltered terrace of 200 sqm. ALEGRIA villa offers a lot of luxury contents with relaxing views, for an unforgettable vacation or a celebration. Our stay at your property was PERFECT. Everything was top notch. We had some trouble with the warm water but the villa manager solved the issue immediately. I hope we get a chance to revisit soon! Sensational island, sensational house BUT most importantly a wonderful group of hosts! Thank you for making our time in Mykonos so special. Beyond grateful for this beautiful property to create everlasting memories. Thank you for sharing our special moments and making our wedding like a fairytale! This house provides me with happiness and endless beauty! I always have the time of my life in here ! ALEGRIA mode forever and ever *all year round* P.S. Hronia Polla!!!! PARADISE! THANK YOU SO MUCH FOR AN INCREDIBLE STAY! Alegria is the perfect summer villa! Pool area is breathtaking with ocean views and the property is luxurious and elegant. Thank you for a memorable stay!! This is by far the best vacation we have ever taken! The photos of Algeria, while spectacular, could not do it justice until you see if in person. The setting looking over the Aegean Sea was breathtaking, the villa was roomy and well equipped. The onsite concierge was so friendly and helpful, she took care of every little detail. I highly recommend this 3rd Home to anyone looking for the trip of a lifetime!